My sister has gorgeous feet. I know, it’s a bizarre thing to say, but she does. She should be a shoe model. It is completely fitting that she should also have the most stellar collection of high heels that I have ever seen. She mostly shops at DSW and I can see why. She took me the last time I was home and the shoes I got are the sexiest shoes I own. My problem is that I’ve never been great at heels, and now that I’m chasing a toddler it’s pretty much impossible. I’m sure that if I worked hard enough I could get my heels back, but I’m not particularly motivated. My sister also has gorgeous hair. Throughout college I wore one pair of flats. Not multiple pairs of the same style. One. Single. Pair. I got them at Wal-Mart and they didn’t give me blisters so that was good enough for me. They were simple black ballet flats and they went with everything. By the time I graduated they had holes in the bottom and they stank to high heaven. Gross. I have a few more pairs of flats now, but if I could have my sister's collection without the height I'd be in heaven. This is my “Bloomin’ Shoes Wishlist”. 1. These black lacy flat are really simple, but add some interest with the lace. They’d be perfect for everyday wear. Interesting, but not flashy. 2. These simple leather flats come in a floral pattern that is really beautiful. 3. These lacy converse-style flats look really casual and comfortable. I probably wouldn’t pair them with a skirt despite the lace. I’d wear them to the grocery store though. Could you just die? Matching shoes!! 5. These yellow leather flats are in my cart right now. 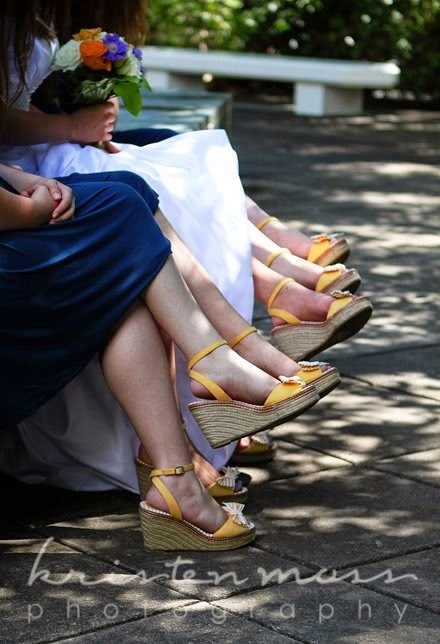 I wore yellow shoes for my wedding and they’ve been my favorite ever since. Besides my wedding wedges I have two pairs of yellow heels. Bright colors are fun to add to otherwise dull outfits. Do you have a go-to pair of shoes in serious need of an update? 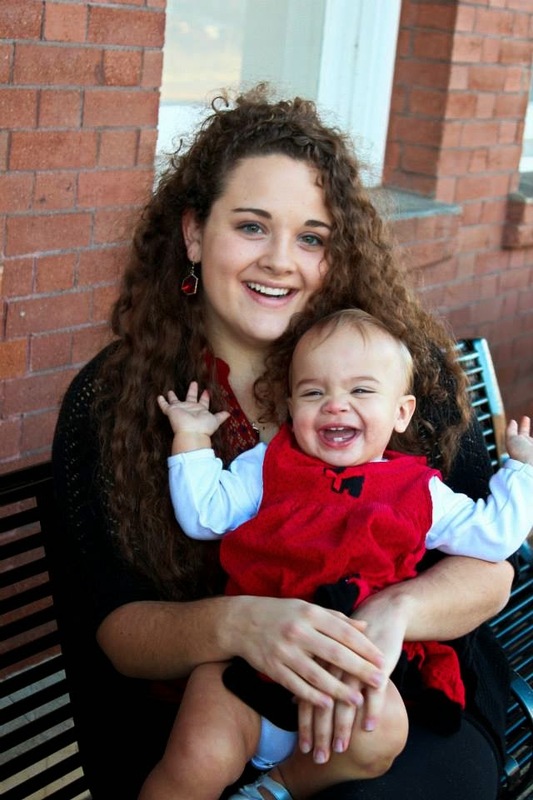 How are you doing with heels and mommy-hood? 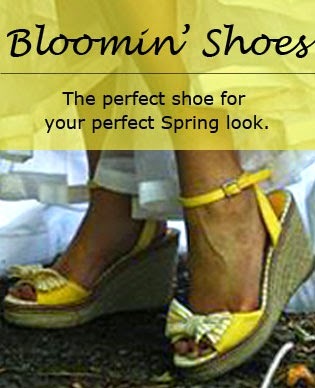 Love the pic of yellow wedges, too cute!